Labor Day supposedly marks the end of summer, but the end of our summer’s heat is nowhere in sight. I’m really not complaining since this summer has been so much less intense than last year, but at this point in the season, no matter how relatively mild the year may be, it’s still been hot for many, many days in a row. 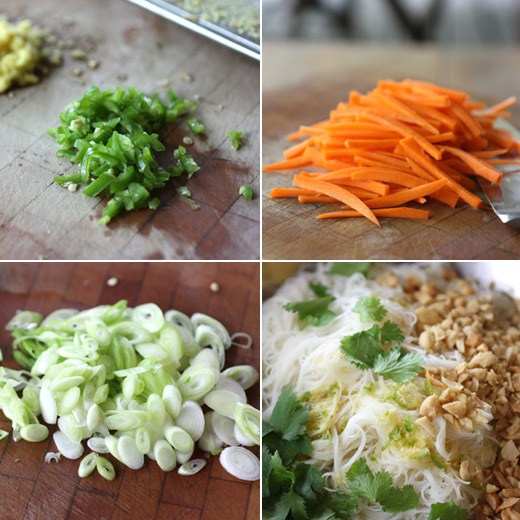 So, as I was going through old recipe files the other day, something that understandably caught my attention was an old article about chilled noodle salads. Nice, cold, crisp salads are always welcome on hot days, but don’t chilled noodles make a salad seem even colder? Maybe they retain their coldness longer than vegetables do, or maybe I’m just imagining that. Either way, I was convinced that chilled noodles and vegetables was the way to go for a few late summer meals. That article I found in the files was just a starting point. 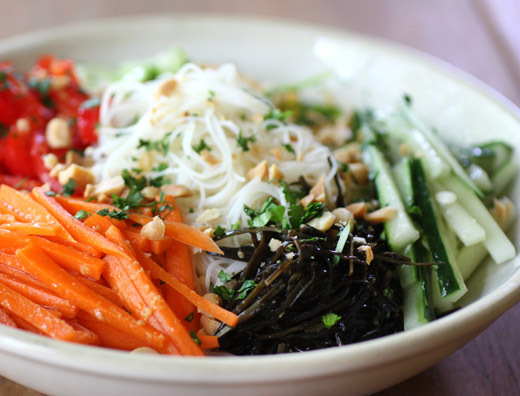 From there, I went on to look up noodle salads in a few books and eventually found the recipe that I worked from for this dish in Vegetarian Cooking for Everyone . The cooked and cooled noodles were mixed with a rice vinegar dressing made with ginger and chopped chiles, and then I served it as a composed salad with the vegetables arranged on top. The changes I made to the original were only out of convenience. Rice noodles were easier to find than mung bean noodles, and I had some arame which I used instead of buying the suggested dulse. The skinny rice noodles were covered with boiling water and left to soften which only takes a couple of minutes. Then, they were drained, rinsed under cold water, and transferred to a big mixing bowl. By immediately tossing the noodles with some dressing, they’re less likely to stick together in a big clump. The dressing was made with rice vinegar, vegetable oil, a little sesame oil, a scan teaspoon of sugar, a big pinch of salt, grated fresh ginger, and finely chopped serrano chiles. I added some chopped peanuts and cilantro leaves to the noodles before tossing with the dressing, and then the bowl was refrigerated while the vegetables were prepped. The dried arame was soaked in cold water for a few minutes until soft, and carrots, cucumber, red bell pepper, and another chile were julienned. Green onions were sliced on a diagonal, and the salad was ready to be composed. A trick I learned from Martha Stewart years ago is to separately dress each item of a composed salad. So, after noodles were placed in bowls for serving, each type of vegetable was tossed in a bowl with a little of the dressing before being placed on top of the noodles. Last, more cilantro and crushed peanuts were used for garnish. The contrast of crunchy vegetables and peanuts with squishy noodles was a good one, and the ginger and chiles offered pops of flavor. Icy cold, chilled noodles will be a great remedy to our ongoing heat until whenever summer really ends. So scrumptious! I cannot resist a cold noddle dish like this one. Have a good week Lisa! 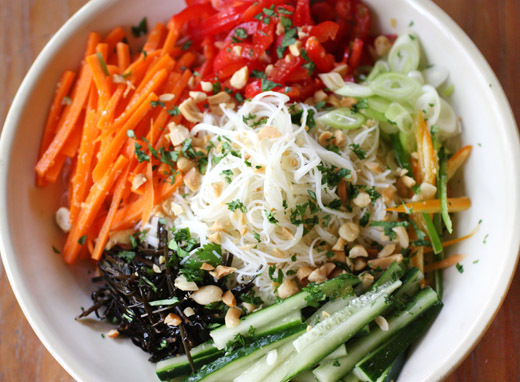 This looks amazing, my favorite Vietnamese restaurant sells a dish very similar to this one. Yum! Oh my. I want you to live next door and invite me to share that with you! Looks tasty and light. I love Vietnamese inspired dishes. Looks delicious! Great photos. I think cold noodles are highly underrated and I'm glad you shared this. What a refreshing recipe for a sultry summer day! September is our "summer" month; it may reach the high 80's! After months of complaining about the summer fog we will beg for it to return as we are unaccustomed to the heat! This is just a perfect dinner recipe for those days! This really looks so inviting and refreshing! Would love that for dinner. Now that's a cold noodle dish! Looks utterly delicious! I love noodle dishes, but I rarely make them cold. I need to start doing this. Yours looks amazing! I love all those beautiful colors which, of course, means lots of flavor! When I lived in LA, Labor Day basically signaled the beginning of warmer temps. This is a great salad to have on those super sweltering days. Great dish - lots of wonderful flavors and colors. So pretty! Cooler weather is coming, but it's still hot here, too. Soon, though, soups and stews! I love this kind of dish, especially when the weather is warm...looks so tasty and beautiful Lisa. Ooooh....love this dish. It's very appetising and great when eaten during hot weather. It's still too hot here to think about fall meals yet but I really can't wait until it cools off. This dish looks so lovely, refreshing, and healthy - yum! I love the colors of this dish. Sounds perfect for a meal on a hot day. oh wow, this is just gorgeous! i just love all the flavors in here, and great tip to dress each of the components individually! I wish I could steal this straight through the screen! It looks just amazing. I like that it is so colorful and has different flavors in it! I know I'll cry and whine when Summer ends... for the moment, this type of meal is my favorite: cool noodles and veggies, and of course, the crushed peanuts on top are a must! I am intrigued by "arame" no idea what it is, will be googling shortly. so much crunch, so little time. i'm pretty excited about the colors and flavors going on here, lisa! I like the clean and fresh flavors in this dish. Strangely enough, I don't make such chilled dishes often. I know you and I share a deep love of that book and yet, I don't think I have ever made that dish. I can't believe it because it is totally my favorite kind of food. Now that I am in a warmer climate - this will be a go-to!